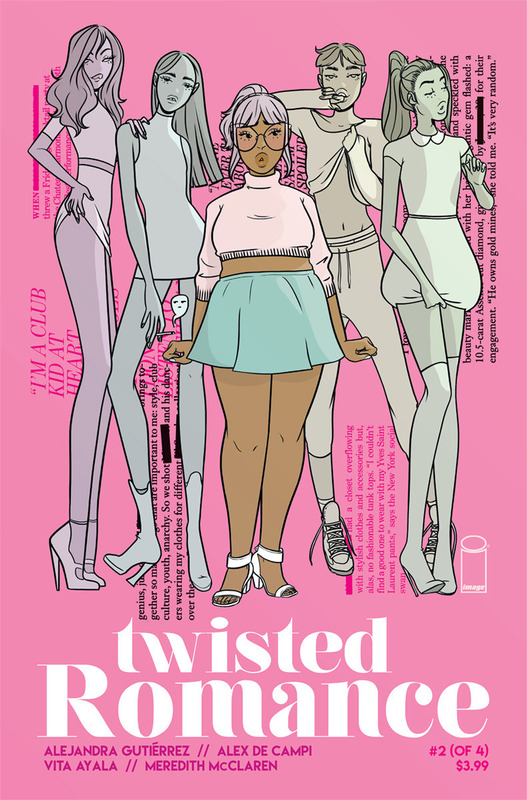 Twisted Romance #2 – I am so thankful for this excellent weekly series. Alex De Campi is an incredible writer who is exploring romance through a number of genres and from different angles in this book. The main story is by De Campi and artist Alejandra Gutiérrez, whose art reminds me of a cross between Brandon Graham and Leslie Hung. It’s about Twinkle, a photographer’s assistant who falls for a gorgeous actor. She’s surprised that he likes her too, especially when surrounded by so many thin, beautiful model types, yet they begin to get close to one another. He has a bit of a secret though, because otherwise this wouldn’t be a “twisted” romance, but instead a pretty ordinary one. Even then, it’s not so much twisted as kind of sweet, and gives voice to a community that has only rarely been seen in comics (or, you could argue, is the basis of superhero comics, but that’s a whole column and I’m trying to not spoil anything here). The backup story is by Meredith McClaren, and it explores the notion of human/AI romance in the age of Twitter bots. It’s pretty cool too, as is the prose story by Vita Ayala. This is a great series, and I’m already bummed out that it’s half over. Bloodshot Salvation #6 – I’ve been enjoying this latest Bloodshot series, but with this issue, there were two things that I don’t really like in comics that held back my enjoyment. One is the Deadside, the weird afterworld of the Valiant universe, and the other is the painted art of Renato Guedes, an artist whose work I usually like a whole lot. The art is just a little too slick for the story I felt. I’m kind of ready for this arc to be done, to be honest. Shadowman and the Deadside just wear me out. Captain America #698 – Cap gets melted out of a block of ice to find himself in a pretty ugly future, with America belonging to the very rich, while everyone else lives in ruins. It’s a good issue, as everything done by the team of Mark Waid and Chris Samnee is, but it feels likes it’s been done before. The central shock of the issue, revolving around just how long Cap’s been frozen, really didn’t work for me. I was enjoying this book more when it was happening in the present, and can already see how this whole storyline is going to play out. 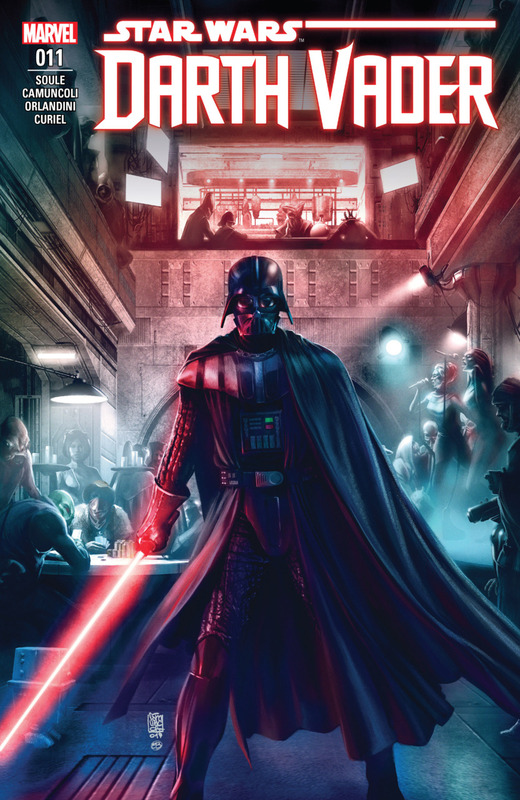 Darth Vader #11 – A new arc has Vader facing new threats in his mission to track down any remaining Jedi knights. He runs across a family of bounty hunters that have been hired to kill him, and that goes much as you would expect. Charles Soule is doing a good job of keeping the early days Vader interesting, which is actually a pretty tough task. 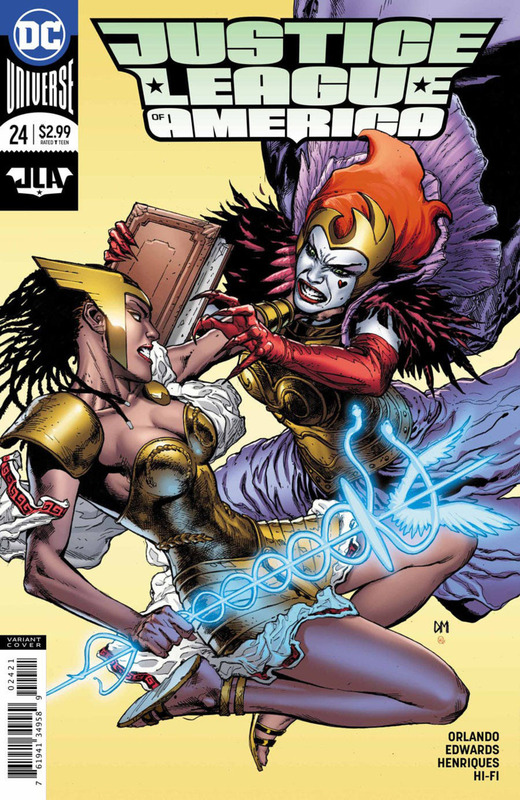 Detective Comics #974 – This issue is big on repercussions and aftermath, as the team deals with the fallout of Batwoman’s actions last issue. I always like these types of issues on team books, where it’s purely character driven. Hearing news that there might be a shakeup coming a DC has me nervous that James Tynion is working towards a conclusion to his big story, instead of simply moving into the next chapter, and that makes me a little nervous. This has been such a consistently solid series since Rebirth began. The Grass Kings #12 – We are given a history lesson on Sheriff Humbert before learning that the Federal Government is looking into the Grass Kingdom, making our band of oddball secessionists very nervous. It feels like Matt Kindt and Tyler Jenkins might be moving towards finishing this series soon, as a lot of individual character arcs move forward at a quick pace. This remains an interesting and unpredictable series. Invincible #144 – I’ve bought Invincible regularly since issue thirty-six, and caught up to the series in trade. Through its entire run, Invincible has been a very special comic, depicting a fully realized universe that was backdrop to some amazing and emotional adventures. Robert Kirkman was never afraid to shake up the status quo of the series, and to put his beloved characters through the wringer. This series began by upending audience expectations, and that never really went away. Artist Ryan Ottley has become a favourite of mine, and it was nice to see original artist Cory Walker put in an appearance and close out the series he helped start. This issue covers many years of Mark and his family’s lives, and completes the long story arc of the Viltrumite Empire. I’m really going to miss this title and these characters, but I applaud Kirkman and company for realizing it was time for the book to end. I imagine we’ll see some of the supporting characters again one day, and I know I’ll be eagerly looking forward to Kirkman and Ottley’s next projects. Justice League of America #24 – We’ve come to the end of the Queen of Fables/Might Beyond the Mirror storyline that has been building almost since this title began, and it’s all kind of unimpressive. I still don’t see the necessity of dragging Promethea back into comics to close off the story, and again found my attention wandering as I read this. What I did like was seeing Vixen being established as a powerful character, and Killer Frost finally coming to some grips with her issues. I know Steve Orlando’s time on this title is limited now; my hope is that this title lives up to its potential for whatever is left to it. Kill or be Killed #16 – Ed Brubaker and Sean Phillips provide us with a very clear-eyed portrayal of what happens in psychiatric wards, and Dylan is drugged to stop him from seeing his demon, but his mind is convinced that this is all part of the demon’s plan. We see that either the demon is real, or we get a good understanding of why it’s so difficult to treat mental illness. This issue, like almost every issue of this series, ends with a twist I didn’t see coming that proves that there’s a lot more to come before this story is over. It’s some really great stuff. 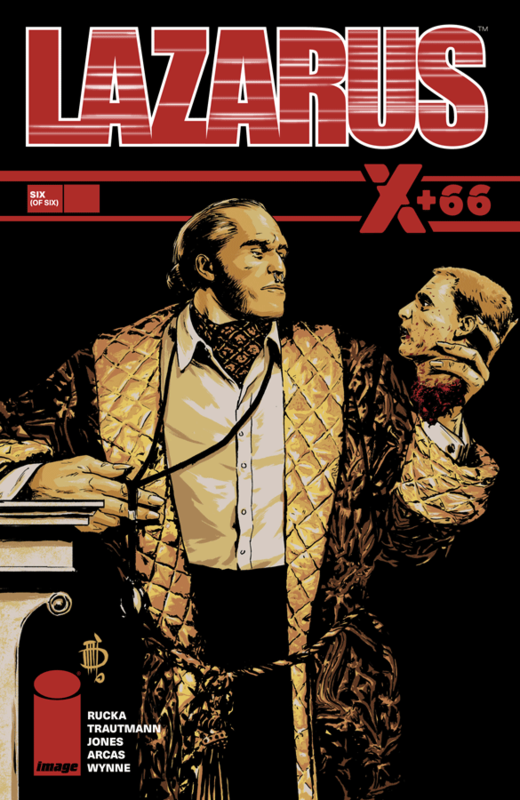 Lazarus X+66 #6 – This interlude miniseries comes to its conclusion with a very dark tale that reveals the history of the Vassilovka family’s Lazarus, the Dragon. This is a bleak comic, told with gritty artwork by Tristan Jones, who is pretty impressive. I’ve liked this miniseries, but I am more than ready for Greg Rucka and Michael Lark to bring back the (very ir-)regular Lazarus series. Mage: The Hero Denied #6 – Matt Wagner keeps this story moving along, although nothing particularly special happens in this issue. Still, it’s a very well-written and gorgeous character-driven book that I thought I’d never read again, so I’m thankful for it. Marvel 2-In-One #3 – As Ben and Johnny prepare to travel to other universes looking for Reed and Sue (based on a lie that Ben told Johnny), they have to deal with the fact that Johnny’s powers are on the wane. This leads to the inclusion of a new character, and an understanding of what’s going on with the Torch. Hercules guest stars, and Doctor Doom looks to be a recurring character. I’m really enjoying this book, and with Valerio Schiti coming in on art, I didn’t even miss Jim Cheung all that much. 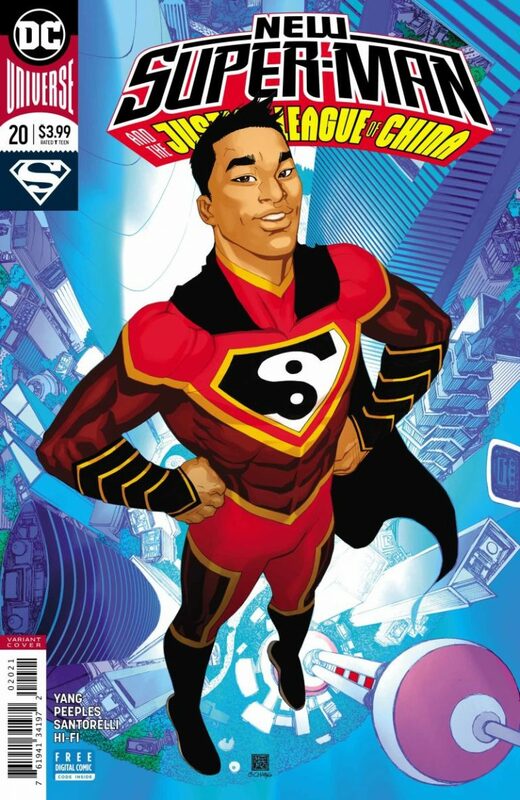 New Super-Man and the Justice League of China #20 – Kenan Kong is not the only focus of this book any more, as it undergoes a bit of a title change and introduces both the Lantern Corps of China, and a likely candidate to be the Aqua-Man of North Korea. It’s as solid an issue as we’ve come to expect from this title, and nice to see that it is headed in new directions after I was convinced it would have been ending with the last issue. The “will they or won’t they” thing that Kenan has going with the Flash might get old, but it’s still kind of fun. Ninja-K #4 – Christos Gage continues to explore the Ninja program, as Ninjak tracks down and meets Ninja-G, the first black female to achieve the designation. 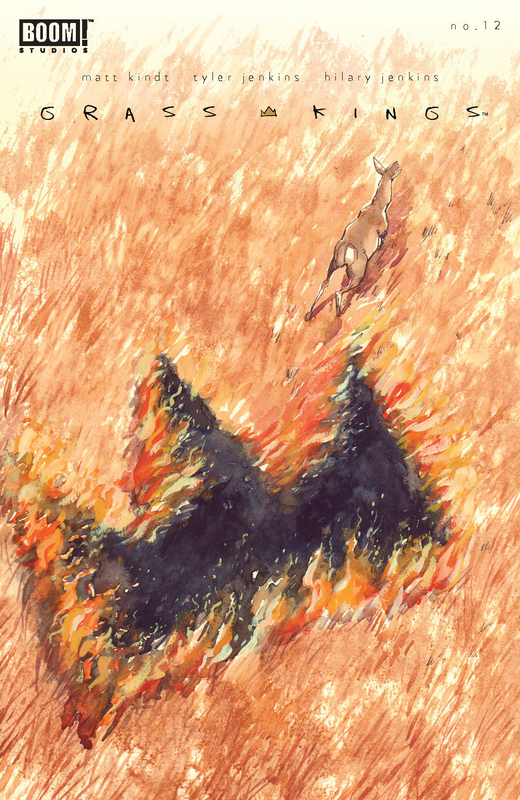 We learn how it ruined her life, and how she claimed it back in a very packed issue. Juan José Ryp handles the art, and while I’m not his biggest fan, I did enjoy a lot of the little details he stuffed into his panels (the cat lapping up blood on a carpet was particularly disturbing). This series has really reenergized Ninjak as a character in my eyes, and I appreciate the extra pages at no extra cost. It’s a good read. Phoenix Resurrection #5 – Thanks to Diamond, I only got this book now, and it’s a bit of a non-event, isn’t it? There are a couple of nice moments between Jean and the Phoenix, and her and a dead character, and I guess it’s not a spoiler to say that Jean Grey comes back, but I don’t see why this had to be a five-issue miniseries to get us to this place. Really, this could have been the first arc of X-Men Red, and that would have made more sense. 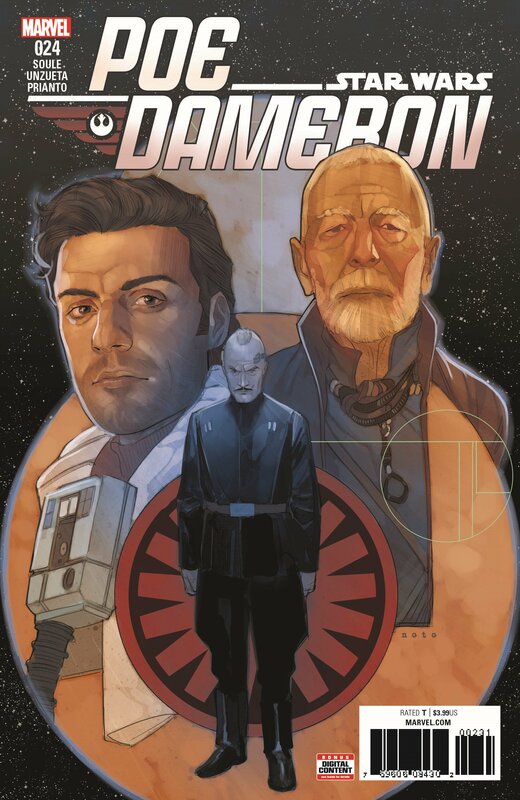 Poe Dameron #24 – I really thought that the end of this issue was going to set up the beginning of The Force Awakens, but Charles Soule swerves some, extending a story probably too much past its best before date. I feel like it’s time for this series to undergo a time period change or something; it’s been spinning its wheels a little too long now. 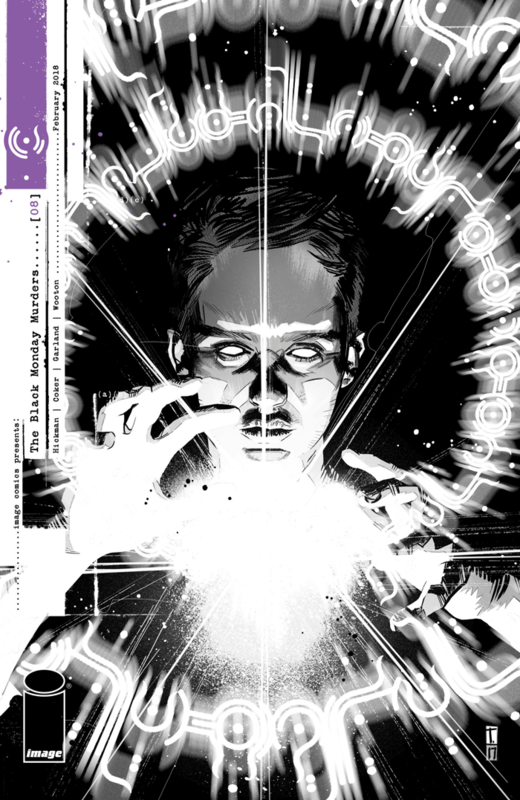 Port of Earth #4 – This continues to be one of my favourite new science fiction series. I like the way Zack Kaplan continues to unspool his main story, while also having TV talking heads examine the ramifications and consequences of creating a space port for alien races on Earth and dealing with extraterrestrial commerce. It’s a very smart series. Punisher #221 – I’m still really liking Matthew Rosenberg’s strange take on the Punisher as an armored one-man army going after a corrupt regime in an Eastern European country. It’s working way better than it should be. Rumble #3 – The tone of this new volume has really changed from the previous one, as things get ever darker, and we see how vigilante militias are never a good thing for a neighbourhood, especially if it’s full of members of a monstrous hidden race. It feels completely different, but is still very entertaining. 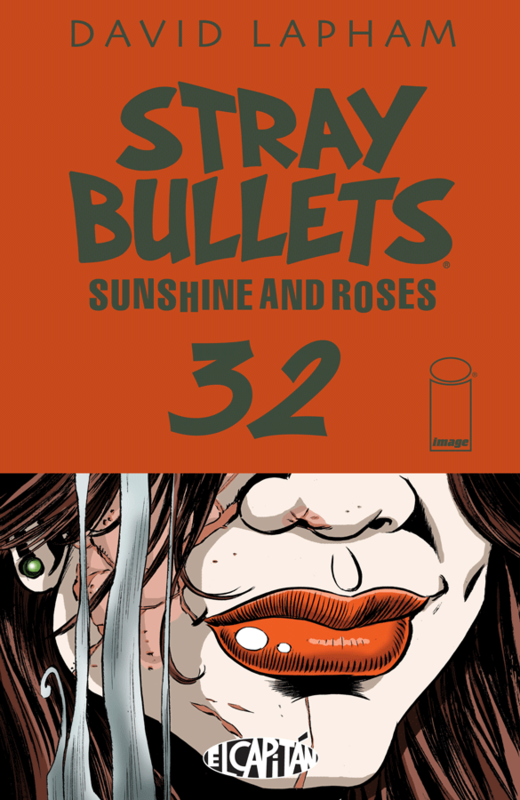 Stray Bullets: Sunshine and Roses #32 – Beth and Nina decide that it’s time for Orson to go back home to Maryland, and that decision doesn’t sit well with him, but a chance encounter with someone who helped them start their crime spree does a lot to get him back on track. It’s another very well-realized issue by David Lapham in a long line of thoughtful and impressive comics. I love this book. X-Men Red #1 – I waited until I’d read the end of Phoenix Resurrection before tackling this new debut. I’m not sure what I think about this series yet, and that is because even though this is an over-sized first issue, it doesn’t do all that much to explain just what Jean is hoping to achieve with her new squad, who the team members are, or why they were picked (beyond Nightcrawler and Namor), or how this book manages to coincide with the established X-Status Quo. All that said, I’m very intrigued to see what Jean’s big vision really is all about, and like that she is coordinating with Atlantis and Wakanda to meet her goals. I think that maybe if this issue wasn’t so decompressed, we’d be further into the story, and I hope that writer Tom Taylor includes a little more material in future issues (six pages were devoted to getting a mutant baby to stop crying). I would also like to see Jean interacting with some of her older friends. She’s just back after a long death, and seems pretty up-to-date on things that happened while she was away; watching her process some of that would be interesting. 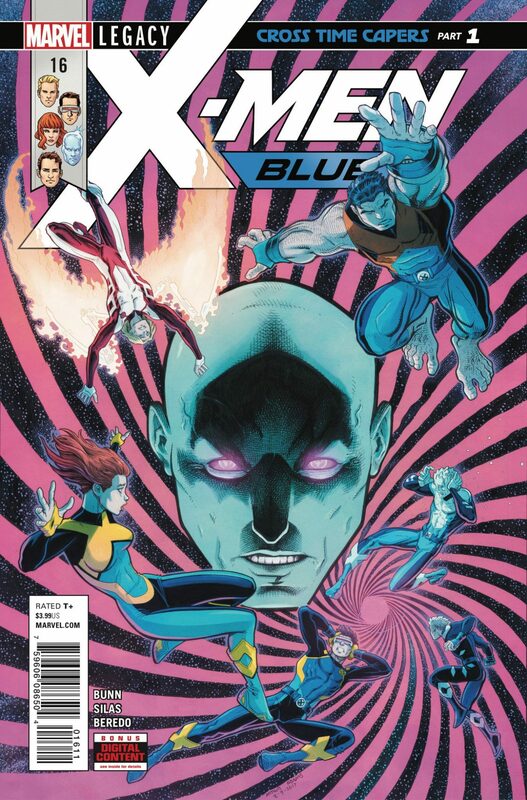 X-Men Blue #16&17 – Marvel is really doubling down on the nostalgia factor with their X-Books. Immediately after a Mojo-centric crossover that has the squads reliving various pivotal battles, the Blue team gets lost in time, where they come across the characters of the 2099 series from the 90s. Are there no new readers left? It’s way too self-referential these days. X-Men Gold #16&17 – I stay on the fence with this book. On the one hand, I like that Marc Guggenheim is striving to tell uncomplicated superhero stories, and that he’s make an attempt to channel the ghost of Chris Claremont some (and yes, I know that Claremont’s not dead yet – I think that might be why it’s not quite working), but things are falling flat. A bunch of aliens from the Negative Zone show up to rescue the green lizard alien guy that the X-Men captured at the start of the series, and along the way they take Kitty and Nightcrawler, so the team decides to go after them. How did they know they were from the Negative Zone? The action moves a little too quickly in places, and the 90s throwback art helps make things confusing at all times. In issue seventeen, drawn by Ken Lashley, I was halfway through the issue before I realized that the woman I thought was either Sage/Tessa or maybe Psylocke was actually Armor, looking nothing like she has ever looked before. Similarly, I kept dreading the notion that the bald guy was Ink. Why is Ink in this book, aside from the fact that Guggenheim created him in Young X-Men, one of those titles that are better forgotten? I know this is supposed to be the flagship X-Book, but it doesn’t really act like it.